Glyn's experience of this as a contributor to the publicity machine of Hollywood was useful to her in her construction of her own author-celebrity. 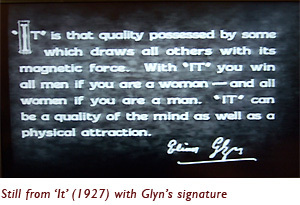 Glyn used photographs of herself and in particular her signature to anchor her writings to her own public reputation. Her signature was put on the cover of her novels and on the intertitles of her silent movies to signify the provenance of the views expressed within them. 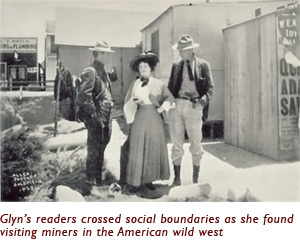 There was an intimate connection between the film studios and Hearst’s American press. The studios needed to make cinemas and their public aware of the latest releases for exhibition. The magazine industry created audiences and film stars. Glyn combined the techniques of film publicity and magazine journalism and employed them across all her publications. In Britain it was common for photographic portraits of prominent women to be published in society magazines. In a similar way movie stars’ "beauty tips" were published alongside a studio photo with their signature in their publicity.